If you are in need of monumental masons in Winchester then look no further because the professionals here at Blackwell and Moody Ltd are on hand to help. We have been supplying and restoring headstone forover 116 year and are accredited members of The National Association of Monumental Masons, The Guild of Master Craftsmen and The Federation of Small Businesses. We cater to all types of customer and are a caring, easily-approachable company offering a friendly and professional service at all times. So to discuss your requirements with one of our staff please feel free to get in touch. All of the services and products we offer are tailored to your individual requirements and are provided to the highest quality by our team of dedicated professionals. All of our prices are very reasonable and for your convenience we accept all major credit cards. So call us today, we are always here to help at such difficult times. Established for well over a century now, we are situated in Magdalen Masonry Works, Alresford Road in Winchester and we have a sister office, W Cornish with premises at 33a Bridge Road in Southampton. We are open from 8am - 4.30pm Monday to Friday and we have clients that come to us from all over the region, so if you are in search of stonemasons in Winchester call upon the services of Blackwell and Moody Ltd. If you would like to enquire about any of the services we offer then please don't hesitate to get in touch. You can give us a call on 01962 852476, send us your query via the "Contact Us" page provided or simply pay us a visit in person. 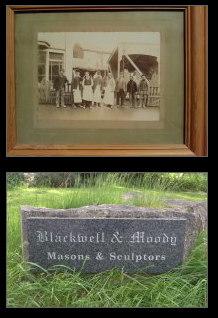 We are always happy to help so for monumental masons in Winchester look no further than Blackwell and Moody Ltd!